This week, I’m going to recognize Thanksgiving with works of art, rather than odes to a holiday that has evolved from “giving thanks for blessings” to gluttony and narcissism (gee, narcissism in this day and age?). What could be more fitting this week—for humans, not the bird—than to show my preferred and the most elegant image of the American turkey? 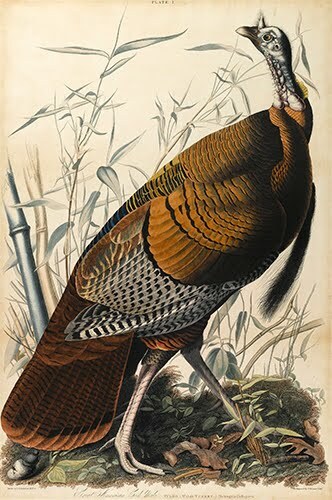 According to Audubon’s own notes, the wild turkey was his favorite bird to illustrate. It was the largest species in his publication The Birds of America. He also noted that he agreed with Benjamin Franklin (1706–1790) that the turkey should have been chosen as the national bird of the US. Audubon’s Birds of America was a landmark artistic endeavor in ornithology (the study of birds). Precursors of such studies date back to the Renaissance. Immediate precursors were The Natural History of Carolina, Florida and the Bahama Islands, published before the Revolution by the British scientist Mark Catesby (1682–1749), and Alexander Wilson’s (1766-1813, Scotland) American Ornithology. Wilson’s publication is quoted quite often in Birds of America. Wilson’s notes in turn often referred to specimens in the first American science museum founded by the brilliant early American artist and scientist Charles Willson Peale (1738–1815). Audubon, born in Haiti and raised in France, immigrated to the US in 1803. From 1819 on, his passion was the study of the native animals of the US. He always produced life-sized watercolors. His usual format showed one example of the bird in profile, set in a background he thoroughly researched. Early in his studies, he devised a way of posing the dead bird (which he often participated in shooting) upright within a wire grid. The Havell engravings were produced on double elephant folio paper, the largest paper available for printing at the time. The copper plate engravings were based on either the watercolor studies or oil paintings Audubon produced of the birds. Audubon supervised the printing and coloring the works in Havell’s London workshop. Audubon probably never envisioned the storerooms of Walmart and supermarkets overloaded with frozen turkeys this time of year! I chose a beautiful plate on which to serve the turkey from a brilliant school of ceramics. And, no, the blue-and-white ceramic is not purposely chosen from “Turkey” because of the holiday, I just wanted to make sure a small turkey would fit on it. Iznik in Turkey has been a center for ceramic (and glass) production since ancient times. It was an ancient Roman center (called Nicaea then) during the Empire (ca. 27 BCE–476 CE). The city is also thought to have produced ceramic tile decoration for buildings during the Byzantine Empire (ca. 330s–1453 CE). It was during the Seljuk period (1037–1326) that the distinctive “Chini” type of ceramics were developed for architectural decoration. This evolved into many distinctive wares during the Ottoman Empire (1326–1923), when the Iznik ceramics were at their peak of popularity. Between the 1500s and 1600s, ceramic arts flourished under the Ottomans, and Iznik thrived as the main center of supply for ceramic tiles for decorating buildings. Chinese porcelain had been known in Islamic lands since the 1400s. Many Iznik artist adapted Chinese decorative styles as competition, particularly the blue-and-white wares that were perfected during the Chinese Ming Dynasty (1368–1644). As the Ottoman Empire increasingly looked toward political and economic expansion in the late 1600s, the interest in protecting the trade in Iznik ceramics declined. So, too, did production of the wares perfected during the 1400s and 1500s. Because the glaze and clay formulas were passed down from father to son, and with lack of imperial support, the Iznik secrets died out during the 1600s. This problem was compounded by the rise in sophisticated European ceramics and imitations of Iznik, as well as Japanese and Chinese, wares. 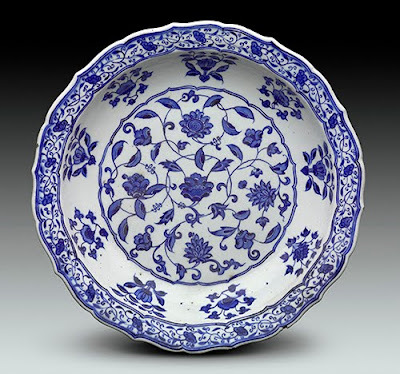 This plate from the early 1500s represents the zenith of the Iznik blue-and-white wares.